One year ago on this day, September 28th, Sherry and I arrived in Dawson City, Yukon. It was cool (minus four) but as the day progressed the sun shone brightly and it felt wonderful: the air was crisp, the leaves on the trees still showed their autumn colours. It's hard to believe all that has happened since that day, one year ago. We spent three months in the Yukon. We saw the first snow and the freeze-up of the river, went dog sledding and endured temperatures that were often reported as being the coldest for any inhabited place on Earth. As our Yukon adventure evolved we witnessed the advent of darkness as the sun all but vanished. Our spirits sagged. The locals were friendly, to a point, but also guarded and lost in their own darkness. It was a strange time, including bite collars and slivers of sunlight at high noon. Three months after settling in Dawson, we landed in Buenos Aires; from a town of 1400 in the frozen north, to a city of over 14 million in the sub-tropical south. For the past six months we have been home, in Vancouver, and on this day, we remember our first day in Dawson City, Yukon. The journey continues. Photos by Jim Murray. Copyright 2012 & 2013. This is something new to our backyard at VanDusen Gardens. To me, this a couple who have journeyed across the continent, likely by train. Finally in Vancouver, this is their moment, however brief, to rest, to close their eyes, to sleep. The work is actually called Departure and it is a life size bronze sculpture by the American artist, George Lundeen. According to the artist, “The original piece came from a sketch I did in the Rome train station. There were a couple of kids across from me on the marble floor. It became the first life-size piece I ever did.” The work was completed over two years, beginning in 1984. The artist is a native of Nebraska, and was a Fulbright-Hayes Scholar studying in Florence, Italy. He established his studio in Loveland, Colorado in the mid 1970s where he continues to live and work. Departure was donated to VanDusen by the late Paul Heller of Vancouver. A weekend getaway on Salt Spring Island during the last few days of summer is a treat. Soon the rains will hit the south coast and days like these will be forgotten. The colours are brighter, more vivid, yet subtle at the same time. The mornings in late September are cool on Salt Spring, and on this particular weekend morning the fog is oppressive. The air is moist and almost heavy. It is quiet early in the morning. People are only just beginning to rise, start their camp stoves to fry up bacon and eggs. Or tofu and miso soup. Or something slightly more Kosher perhaps. The beach at Lakeside Gardens on St Mary Lake is empty, of people, and the fog is low. As the sun comes out in the early afternoon, temperatures rise and the dustiness of autumn is in the air. Spider webs are everywhere and they glisten in the sunlight. Dragon flies dart back and forth near the lake, rarely stopping, except briefly. Sometimes. Last week was sunny and hot throughout much of the south coast and the weekend was fine too. Temperatures approached the mid-twenties, and for one extended weekend we headed back to Salt Spring Island and Lakeside Gardens Resort. Friday began with fog and a lengthy ferry to Long Harbour. By the time we arrived the sun was shining and there was a gentle autumn dust in the air. We stayed in Cabana 7, which is probably our favourite. It offers excellent views of St Mary Lake, wonderful sunsets, and a bit more privacy than some of the other cabins. Everything was in place, as usual, and all our cares slipped away. The ladder leads to an upstairs which consists of a bed. Note the reading lamps on each side, and observe too the railings to keep you from falling out of bed in the night. There isn't much room to move around up here (no standing, or sudden movements allowed), but the view of the lake in the morning, through the little window, is amazing every time. And one look at the lake tells the story. This is a beautiful place to be. Lakeside Gardens is a friendly and well cared for place. It feels good to be here and the large number of repeat customers is testament to that fact. Some of the regulars now span three generations. There is peace here, and the light on the lake is a wonderful thing to behold no matter the season. It is a gentle place, and if you don't mind climbing a ladder, it's like camping, only better. All photos by Jim Murray. Copyright 2013. There is much standing around while surfing. Or so it appears. Is this wave right? Or should I wait for the next one? Kind of like finding the right parking space. Should I drive around a bit more? Oh damn. I should have taken the one back there. For the little time spent riding the wave, much more is spent waiting. And waiting. It seems to be worth it. September 11th is a day to remember. 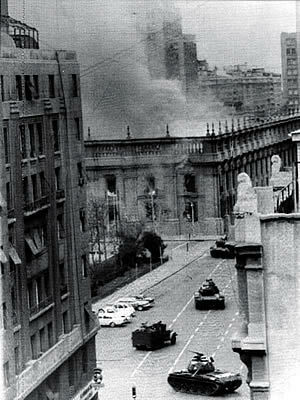 It was the day the US overthrew a democratically elected government in Chile in 1973. Salvador Allende had led a ramshackle group of leftist parties to victory three years earlier in 1970. There was no dispute about the election, it was fair in every way. The rich landowners and business people were less than enthusiastic. Nor was the White House of Richard Nixon. The US led a vicious campaign of disinformation against Allende from the day of his election, pouring millions of dollars into the effort. 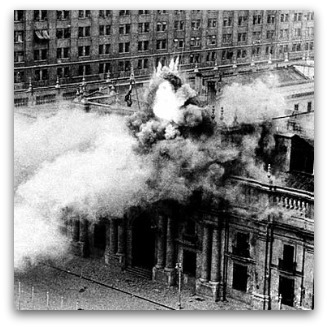 Ultimately the CIA and the Chilean military conspired to conduct a coup against the Chilean presidency. 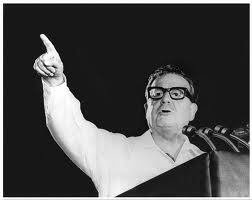 Allende was killed and over the next few weeks and months and years, thousands more were killed or disappeared. The junta lasted seventeen years. We should never forget what happened on September 11th. 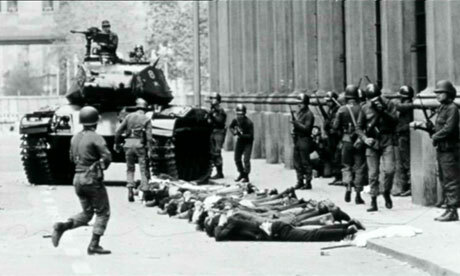 and the victory of Chilean democracy all those years later. Read my post about the film: No here. Visitors and giant brushes. The Touch Wood exhibit, now in final days, is an inviting collection, and as summer gives way to autumn the views are constantly changing. The Last of the Giants, by Steve Paterson and Janice Wood depicts the industry that originally built this province and created many fortunes, including that of the namesake for VanDusen Gardens. The installation is made of steel, rebar, steel mesh, stucco and moss.